I know it's a bit too early for Christmas, but you know when you see something that catches your eye and you can't seem to get it out of your mind and you just have to do something about it? Well, that's what happened to me. Christmas is everywhere. In the stores and online. I was looking at Christmas decor on the Neiman Marcus website and came across a very expensive Floral Tree Skirt. The skirt reminded me of a Christmas in July post by Yvonne of StoneGable in which she featured a beautiful white Poinsettia Christmas Stocking made out of felt. I was truly inspired and pinned the stocking for future reference. When I saw the Neiman Marcus tree skirt, I knew I could make one using Yvonne's tutorial for the poinsettia flower. 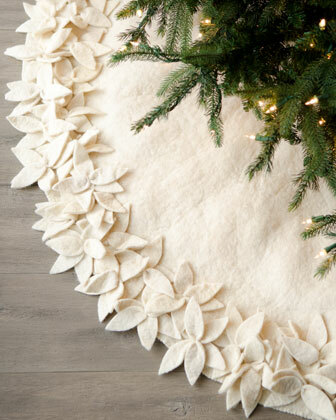 I also looked online for directions to make a tree skirt and found one I could make in ten minutes by Martha Stewart. 1. Fold the fleece or felt in half to create a triangle. Fold the triangle in half to create another smaller triangle. 2. Use the bulldog clip to attach one end of a long string to the folded corner of the fabric. Tie the string to the top of the pencil. Holding the string taut, swing your "compass" from edge to edge in a quarter-circle, drawing an arc with the pencil. Cut along the pencil marks. 3. With the fabric still folded and using the small plate as a guide, trace an arc onto the folded, 90-degree corner of the felt. Leave it folded, and use scissors to cut along the trace marks. 4. Unfold the fleece halfway, and cut a slit along one of the folds from the edge of the circle cutout in the middle to the edge of the fleece. 5. Set the skirt aside while you make the poinsettia flowers. I chose fleece for this project because the felt in the fabric stores near me looked awful and hard in comparison to the fleece which was much softer. I was able to get it for 50 percent off, plus an additional "senior discount". The skirt is 60 inches in diameter and it needed forty-four poinsettia flowers (whew) to completely cover the edges of the skirt. I purchased a total of four yards of white fleece for both the skirt and flowers. 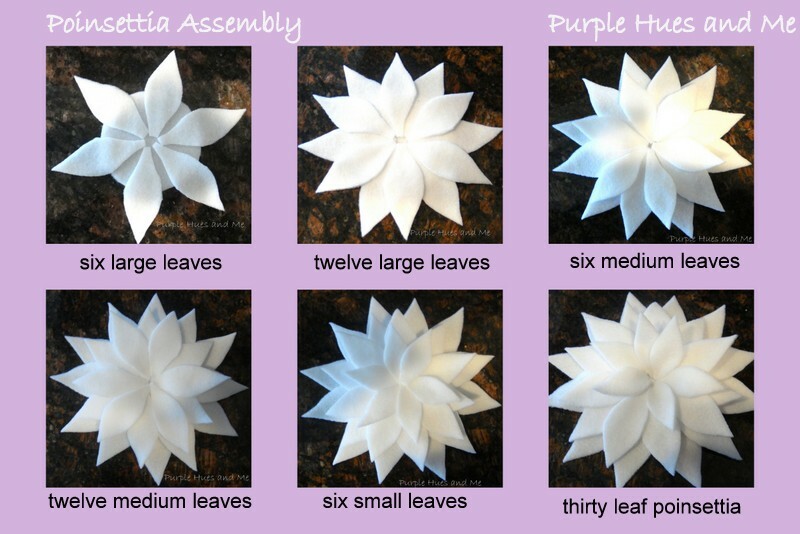 Using Yvonne's tutorial as a guide, (I had to tweak her directions since I had to make so many poinsettias, and use every inch of fabric). I needed a poinsettia pattern to follow because I can't draw or cut freehand. I used the same pattern for all three of the leaf sizes and just adjusted them in Microsoft Word. To start, I cut 3", 2 1/2", and 2" wide strips of folded fleece. Next I cut the 3" and 2" strips into 1 1/4 wide rectangles. The 2" strip, 1" wide rectangles. Once I had a rectangle for each size, I used that as a pattern and was able to quickly cut out all the rectangles. For each flower I made piles of twelve large rectangles, twelve medium rectangles and six small rectangles. I then cut each rectangle using the leaf patterns. I used a small 7oz. plastic cup to draw a 3" circle. I cut out 8 at a time. To fill the bottom of the skirt, you'll need to make at least forty or more. I laid out the flowers just at the edge of the skirt and glued them down with fabric glue. A sixty inch circle is rather large. Cutting and putting the flowers together became very tedious for me. Some days I would just make a few, other days I would make more. It seemed like I would never finish. But I did. Can't wait until I decorate for the holidays . . .
Beautiful job, Gail. The patience you have to cut all those leaves, well worth the gorgeous results. Thanks, Brandi! I really don't have that much patience. I stopped for a while because I was sick of cutting out the leaves. I kept telling myself I have to finish! Gorgeous Gail!! I'm envious! Want one! Thanks Danni! You have nothing to be envious about. You always "rock" your projects! Absolutely beautiful! Love it! Thanks so much for the great tutorial too. Honestly, I think it looks better than the Neiman Marcus one. Well done Gail!!! Thanks Tuula! I'm thinking about adding some sort of decorative something, but can't decide. I agree - thanks for the step-by-step directions!!! Hi Gail, I’m Anne from Life on the Funny Farm (http://annesfunnyfarm.blogspot.com), and I’m visiting from the Pinteresting Party. This is so beautiful! Very rich and elegant looking, and yet it was made from simplicity itself: felt. Fantastic! Gail, I would have never been able to sit and make all those poinsettias! The skirt is gorgeous and I love the way you styled it for the photo. The white lights and the white skirt look so very snowy. Beautiful. This is such an original idea. Thank you for sharing. We may have met by chance...but we become friends by choice. Sooooo lovely!! Love it! Great job Gail!! Gail, your patience paid off. How beautiful! And, how much money you saved over the Neiman Marcus skirt? Please ignore the question mark at the end of my comment. Sorry for the typo. What an inspirational idea !!! I can't wait to get the fabric and get started !! Better hurry because Christmas is very near..thank you for this project. I have just now signed up for your blogspot !!! Oh, my holy criminy--this is beautiful! What a lot of work cutting all those leaves but well worth it. Definitely a project worth starting this month rather than next. I am so impressed and I just love this! Met you through Debbiedoo's. The poinsiettias look so simple to make and yet look so incredibly effective! You've done an excellent job here! Beautiful and useful posts about Homewares! Your poinsettia tree skirt is so pretty! I'm sure it took a lot of time and patience and thanks for sharing the tutorial as well! Gail, This is FANTASTIC! You did an awesome job! It's not to early for Christmas decor as far as I'm concerned! I've started putting some up already since I'm not hosting Thanksgiving this year...plus by showing these projects sooner it gives others more time to make one themselves! Oh my gosh, this is absolutely beautiful!! You did an amazing job. I want to do this. Thanks for the awesome tutorial, too! I see a project for my Thanksgiving Break. LOL Thank you so much for sharing at A Bouquet of Talent this week. I am always so thrilled to have you. This is sooo beautiful!! You are a very talented woman. I don't know how you were able to get "senior discount", you are way to young for that. Wow this is so beautiful! What types of lights are on yor tree? Those look beautiful and different too! Oh wow, that turned out great. I'm loving white Christmas decor this year. Visiting you from Debbiedoo's party and I am your newest GFC follower (us newbies have to stick together)! I would love if you would take the time to visit my blog and follow back - http://sarahsaturdiy.blogspot.com. that is simply beautiful! Cudos to sticking with the tediousness of cutting and gluing. it turned out fantastic! The fleece looks soft and fluffy, too! Thanks for sharing. Just wanted to stop by and let you know you have been featured at Share It One More Time....www.onemoretimeevents.com...hope to see you this week. That sure was a lot of petals to cut....it turned out gorgeous and very, very elegant. Congrats on the feature @ Kathy's. I am following you, now! That turned out just gorgeous! Nice work. i love it and want to make one now. yours is prettier than the store one :) thanks for just great instructions. About how much does this cost to make? Wow! So special and beautiful! This is gorgeous! Those poinsettias must have taken forever. Great job! Pinned! I can see why this was picked as your favorite of 2012! This is beautiful! I am following via GFC, Pinterest & G+! I LOVE this! I love the white on white. I do an all white light tree and haven't been able to find a skirt I like, but again, I LOVE This! I think I would add a pearl to the center of each poinsettia to take it up just a notch. I know that would be even more tedious, but I think it would be worth it in the end. I better get started NOW (Jan)! LOL Thank you for posting this!!! Hi, Gail! I love, love, love your tree skirt, and I've already purchased my fleece to make tree skirts for me and my daughters for Christmas 2013! May I ask what size each of your leaves are? I see that you've cut your strips in 3", 2 1/2", and 2", so I'm assuming the leaves are a little smaller than that? Can you machine wash it? I'd love to do something like this, but I have cats, so it would be a furry disaster by the end of December! Yes, hand washing should be ok. I used a good quality fleece to make this and the poinsettia flowers are glued on with fabric glue. I haven't tried washing it though. OMG, Gail, this is absolutely breathtakingly beautiful. I think I can, I think I can, I think I might. Ha HA Hhaaa!!! Do you think it would be a safe precaution to use SCOTCHGARD Water Repellant on it? I love this idea of you making the tradition of tree skirts. I can't decide which one I like better, they both are so cute! return comments link. Happy Thanks Giving! This is so gorgeous Gail! The time you put into it shows. I don't know if I have that kind of patience but I love this. Wow, what a beautiful tree skirt, Gail! It's so elegant and timeless.